Most of the time zones on land are offset from Coordinated Universal Time (UTC) by a whole number of hours (UTC−12 to UTC+14), but a few zones are offset by 30 or 45 minutes (for example Newfoundland Standard Time is UTC−03:30, Nepal Standard Time is UTC+05:45, and Indian Standard Time is UTC+05:30). Some higher latitude and temperate zone countries use daylight saving time(DST) for part of the year, typically by adjusting local clock time by an hour. 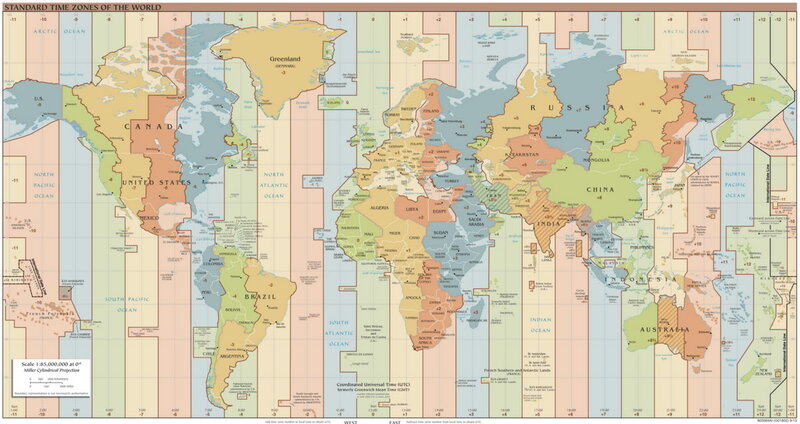 Many land time zones are skewed toward the west of the corresponding nautical time zones. This also creates a permanent daylight saving time effect. Every airline in the world, tries to gain biggest amount of profit and it can’t be happened without increasing number of flights and managing them in an efficient way. In the other hand it means no airplane should stay a long time on the ground if its airline wants to make more money! For this strategy, every airline, works on accurate schedules to reduce keeping their airplanes on the earth. An efficient accurate schedule can’t be done without considering time zones and daylight saving time(DST). An airplane, departure an airport at the local time (Time Zone A) of the origin city (Departure Time). It takes specific amount of time in hours and minutes until that airplane reach its destination (Flight Time). airplane land at the destination airport at the new local time (Time Zone B) of the destination city (Arrival Time). This is why time zones are very important in commercial aviation because they are main variables in flight schedule formula. There is a flight, scheduled from Chicago in United States of America to Indianapolis in United States of America. When airplane arrives at Indianapolis Airport at 8:00PM, the same aircraft will depart at 9:00PM (1 hour after arrival time) and return to Chicago. Flight Simulator softwares are designed to simulate flying an airplane in the virtual world. From the first generation of flight simulators, many years passed. Hundreds of new addons produced by different companies and they made flight simulator environments a great place for flight lovers who enjoy spend many hours flying an airplane in a wonderful virtual world. If you would like to read more about Flight Simulators time zone defect you can read this page Or you can search the web for more details. Time Zones are not match real worlds time zones in flight simulators softwares like Flight Simulator X (All versions), Flight Simulator X STEAM Edition, Prepar3D (All version). Even the latest 64bit of the Lockheed Martin Prepar3D V4 still has the old inaccurate time zones. All American cities have a wrong start and end DST (Daylight Saving Time) dates. DST in United States of America starts March 12th, 2017 and it ends November 5th, 2017 but if you fly from/to any American cities in late March (13 to 31 March) or in first November (30 October to 4 November) you will have a wrong departure/ arrival time. Canada cities (Except Toronto) don’t have DST at all! and it means all flight’s departure from and arrivals to Canadian cities from March 12th, 2017 to November 5th, 2017 are not correct. What is SimElite Solutions Time Zone Fixer? 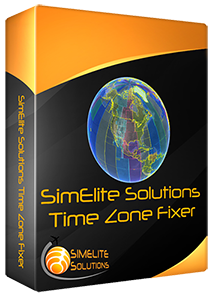 SimElite Solutions Time Zone Fixer is a new product made specially to fix all Time Zone problems in all flight simulator softwares like Microsoft Flight Simulator X (All Versions including STEAM Edition) and Lockheed Martin Prepar3D (All versions including Prepar3D V4). It is a low price must have addon and together with FS Real Time addon you will be able to fly in Flight Simulator on accurate schedules same as the real world! The whole globe's Time Zones will be worked correctly. The whole globe's DST (Daylight Saving Times) will be worked correctly. Can be installed easily and it will update flight simulator’s configurations automatically. Can be used standalone or beside FSRealTime Addon(FSRealTime will use these fixed and accurate Time Zones). Because the DST start and end dates changes every year, new yearly updates will be released to adjust DST. All inaccuracy reported feedbacks will be reviewed and new patches and updates will be released quarterly.